– Carbally, Adoration at altar of Repose in Tramore until 10 pm. 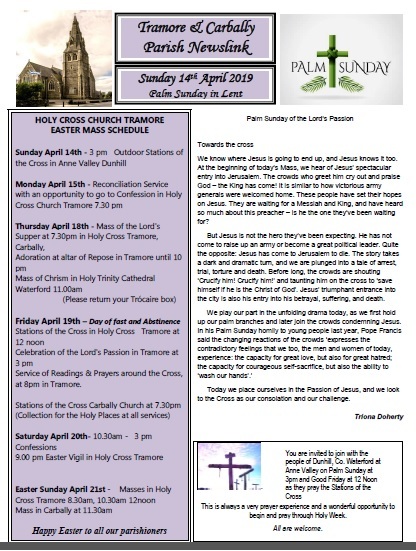 – Service of Readings & Prayers around the Cross, at 8pm in Tramore. We know where Jesus is going to end up, and Jesus knows it too. At the beginning of today’s Mass, we hear of Jesus’ spectacular entry into Jerusalem. The crowds who greet him cry out and praise God – the King has come! It is similar to how victorious army generals were welcomed home. These people have set their hopes on Jesus. They are waiting for a Messiah and King, and have heard so much about this preacher – is he the one they’ve been waiting for? But Jesus is not the hero they’ve been expecting. He has not come to raise up an army or become a great political leader. Quite the opposite: Jesus has come to Jerusalem to die. The story takes a dark and dramatic turn, and we are plunged into a tale of arrest, trial, torture and death. Before long, the crowds are shouting ‘Crucify him! Crucify him!’ and taunting him on the cross to ‘save himself if he is the Christ of God’. Jesus’ triumphant entrance into the city is also his entry into his betrayal, suffering, and death.